Atomas is an atomic-powered superhero whose origins remain mysterious. In 1999, Atomas, Prof. Sinclair and his daughter, Bella, thwart the evil schemes of the megalomaniacal Borg (Sinclair's former student), who wishes to become Master of the World. Borg uses a giant electro-magnet invented by Sinclair to cause the Moon to crash into the Pacific Ocean to plunder its riches. Atomas then rescues the Professor and Bella from Borg's clutches, fighting the villain, its robot armies and deadly inventions, in the cities of Nucleapolis and Selenos. Eventually, Borg is defeated and forced to flee into space with the Moon. 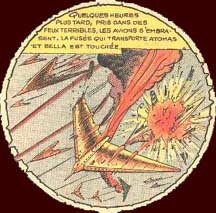 Atomas was first created by writer Robert Charroux for artist Auguste Liquois. But only a few (one?) pages by Liquois are known to exist. The series was quickly taken over by artist Pellos and serialized in the weekly magazine "Mon Journal" from No. 70 (1st January 1948) to No. 86 (22 April 1948). No. 86 was the last issue of "Mon Journal" which was then merged into "Zorro". The last two pages of the story were drawn by yet another artist who signed "d'apres Pellos" -- based on Pellos, but was not otherwise identified. 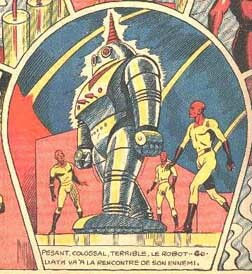 To date, Atomas has never been collected in the graphic novel format. For "Mon Journal", Robert Charroux wrote a space opera serial entitled L'Ile volante du Prof. Barthélémy [Prof. Barthelemy's Flying Island]. In the 1960s, Charroux went on to become the best-selling author of a series of Eric Von Daniken-like books about ancient alien astronauts. His most famous work of that period is Histoire Inconnue des Hommes depuis 100.000 Ans [Unknown History Of Man Over 100,000 Years] (1963). FOR MORE ON AUGUSTE LIQUOIS, . FOR MORE ON PELLOS, .